One UFC Champion has his eyes on former WWE Divas Champion Nikki Bella. 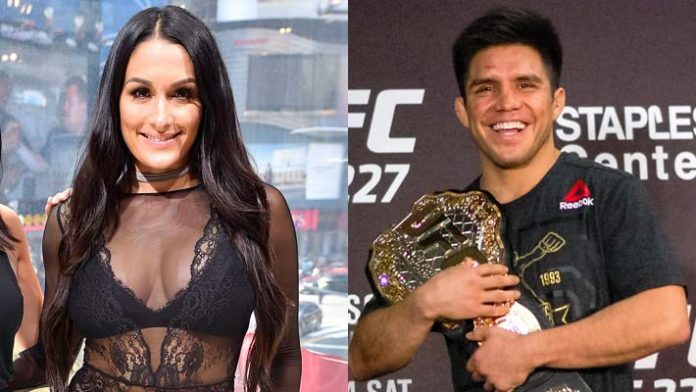 UFC flyweight champion Henry Cejudo is riding high off a recent knockout victory over a fellow UFC champ. “The Messenger” defeated bantamweight champion TJ Dillashaw via knockout in under a minute of the first round. It was Cejudo’s first title defense since unseating longtime flyweight champion Demetrious “Mighty Mouse” Johnson this past summer. The former Olympic gold medalist discussed his win on “The Ariel Helwani MMA Show” this week. Thank you to the great Nikki Bella for sending this, especially so quickly. Incredibly cool of her. ICYMI: here’s Henry shooting his shot yesterday with Nikki. Legend. What do you think about Bella’s response to Cejudo?